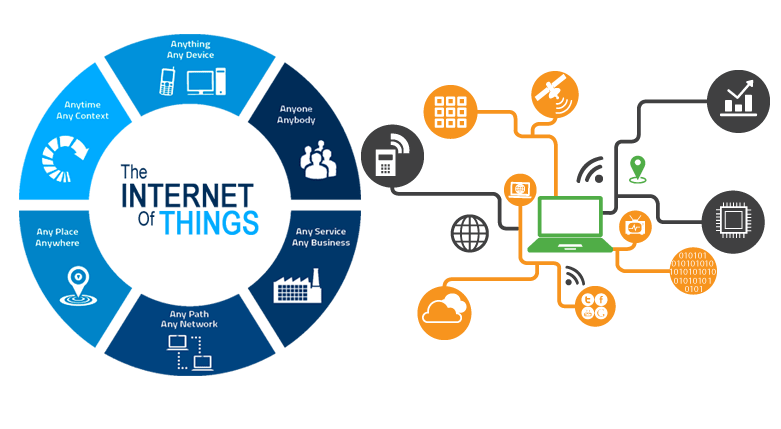 Internet of Things are physical devices connected to the internet with capabilities to identify itself to other devices using an IP address to transfer data over network for remote monitoring and controlling. IoT advanced from Machine-to-Machine (M2M) interaction to enable smart devices using processors, sensors and communications hardware to accumulate, transfer and act on data with or without human intervention. IoT also exploits artificial intelligence, big data, cloud computing, networking and sensing for product or service delivery. IoT creates network for communication between its devices at smaller and cost reliable scale for efficient connectivity. IoT essentially make use of artificial intelligence and big data for enhancing network devices. The use of sensor in IoT devices transforms passives devices to active device for real-word integration. Off all, IoT offers control, automation and analytics for clear insights for effective management of resources. The IoT is not a solitary technology. It is a combination of various hardware and software technology working together where integration of information technology refers to hardware and storing, retrieving and processing data is done using software for communication. The IoT is much more than M2M communication that includes sensor networks, micro controller, microprocessors and communication protocol working as an electronic system for possible “Internet of Things” applications. There is a mixt of communication technologies and protocols that needs to be adapted for efficient IoT application such as – NFC and RFID, Low-Energy Bluetooth, Radio Protocols, Ethernet, LTE-A, Wi-Fi and so forth for enhanced speed, security, reliability and energy efficiency. Finally, these enabling technologies can be broadly categorized into – technology acquiring contextual information, technology enabling contextual information to be processed and technology to improve security and reliability. Sensor and Actuator layer interconnecting physical world to digital world for collecting real-time data and information and interacting with them. Sensors have wide range of applications for measuring physical property (temperature, speed, movement, pressure, electricity, etc.) and converting it to signals. On the other hand, actuators can intercede to change physical condition such as move robotic gripper, shut off power supply, adjust valve, etc. Together, sensor and actuators can collect all data for further analysis. Gateway and Network layer act as a medium for collected data and transferring using protocols. Gateways such as microcontroller and microprocessors along with network devices such as Wi-Fi, GSM, Ethernet, etc. in form of public, private or hybrid model act as a medium to process and forward data to the next layer. Data Management and Application layer performs processes received information for analytics, security, modeling and management. In IT layer various tools and technologies are used for filtering and extracting relevant information from massive data source such as – in-memory analytics (allowing large volume of data to be changed in RAM for faster querying and decision making), streaming analytics (for data-in-motion analytics for real-time decision making), data management (for privacy exposure and restricting unnecessary data processing), data filtering (exposing relevant information for application), data abstraction (for business view of data) and ensuring data security over all layers. And, the system loops when input is received. Thus, IoT architecture serves to illustrate how various layers work together to form IoT deployment for various IoT applications in all domains. IoT can interconnect all devices around the globe for information and communication. IoT enables heterogeneity in devices based on network and hardware platform to interact with other devices or service platform. IoT makes use of sensor technologies reflecting true awareness of the real-world from analog signals. IoT connectivity enabling accessibility and compatibility for common ability to produce and consume data to and from network. IoT enables interaction with the physical world with a means to interact intelligently with semantics of data. IoT with artificial intelligence giving brains to devices for smart product experience. IoT design must incorporate safety of data and personal well-being. IoT being network operating and communication raises various level of security risks and attacks. Data privacy is another important concern relating to security of IoT devices. It is seemingly complex in design and development with numerous devices and technologies. IoT offers less flexibility as system designed for one purpose is little difficult to be integrated to another. Need for connected system to incorporate interoperability to be able to communicate using same language and protocols. Data handing is crucial and complex when interaction with the physical world is involved. Refrigerator with LCD screen guiding you about expiring foods and groceries to buy. Energy consumption monitoring and analytics for cost reliability. Water quality detection for consumption of water. Tracking collars for protecting wild-file using GPS tracking. Monitoring physical activities like breathing, heart rate, sleeping and so forth using smart sensors. Bluetooth connected toothbrush for monitoring brushing habits. Cropping field monitoring to control electricity, fertilizing and watering. Controlling micro-climate in green house for quality production of fruits and vegetables. Smart road with smart diversions and message based on climate conditions. Real-time monitoring of parking space availability. IoT is exploiting to make all domains smarter with hype around IoT being huge. Where to look for Internet of Things service? Codigion empower organizations with our IoT services to offer designing, development and deployment of IoT process with existing business architecture in order to connect and scale efficiently with smart recognition, monitoring and administration. Our services cover it all ranging from IoT Consulting and Solution Development, End-to-End System Integration, Security and Testing, and Maintenance and Support. We make sure to walk you all the way – to identify all business pain points that IoT can solve with industry insights, benchmarks and roadmap for desired business efficiency and user-centric transformation along with POC plan. However, our focus is on Enterprise IoT, Industries IoT and IoT Security.